It is an established theory that comets may have, in some way, seeded life on Earth. Some extreme ideas support the panspermia concept (where bacterial organisms hitched a ride on comets, asteroids or some other planetary debris, spreading life throughout the Solar System), while others suggest comets may have contributed the chemical building blocks essential for life to form 4 billion years ago. We know these icy bodies are also awash with organic compounds, so it’s not a huge leap of the imagination to think comets may have donated life-making material to the early Earth. In an effort to study cometary material and its possible influence for nurturing early life on Earth, Prof. Akiva Bar-Nun of the Department of Geophysics and Planetary Sciences at Tel Aviv University has been creating his own comets in the laboratory. By doing this, Bar-Nun is hoping to gain a better perspective on how comets acquired their composition of the noble gases Argon, Krypton and Xenon. The proportion of these elements are found in the Earth’s atmosphere, but are not thought to have originated from the rocky material our planet consists of. By understanding the proportions of these elements that formed in the icy laboratory environment, if the proportions match that of what we’ve measured on Earth, it goes to some way in explaining how comets formed in space and how they delivered organic compounds to the surface. Prof. Bar-Nun and his team carried out the research using a comet-making machine unique to Tel Aviv University, and although the original press release is light on the details, it is assumed the chemical composition of the early Solar System was recreated and then deep-frozen. Comets formed some distance from the Sun (and a vast number of them populate the Oort Cloud), water vapour would have condensed and frozen, in temperatures as low as -250°C, trapping a primordial collection of chemicals inside their dusty, icy interiors. Some time after, these comets may have fallen into the inner Solar System, many impacting the Earth. 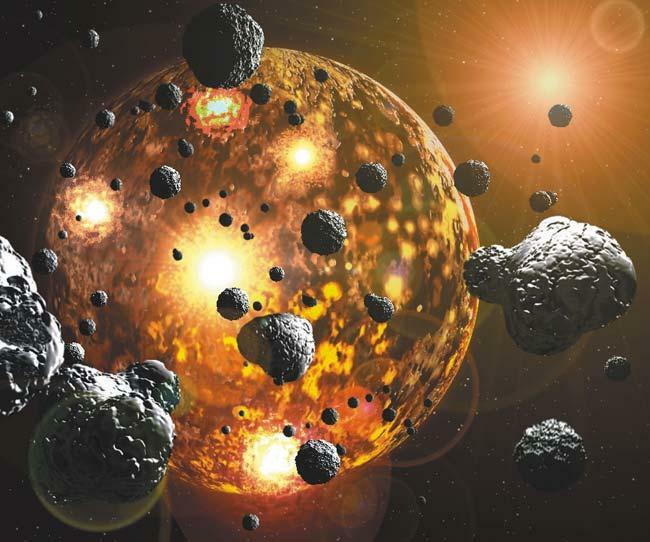 Amino acids may have been introduced to the surface and oceans, or vital chemical components from the comets combined with chemicals already on Earth and life was sparked. When this happened, these comets would have left a chemical fingerprint. Bar-Nun’s team were successful in creating their own synthetic comet, freezing water vapour, creating a natural ratio between the three elements. Then a link could be made, from the laboratory comet, with the very definite noble gas proportions, and the proportions of these gases found in the atmosphere. “The pattern of trapping of noble gases in the ice gives a certain ratio of Argon to Krypton to Xenon, and this ratio — together with the ratio of gases that come from rocky bodies — gives us the ratio that we observe in the atmosphere of the Earth,” added Bar-Nun. Judging by the information available (the paper is published in the journal Icarus), Bar-Nun’s research has provided evidence that comets left a unique ratio of stable noble gases in the atmosphere, a ratio of necessary materials for life to eventually form.